Over the past decade, we have developed and tested the techniques needed to achieve better than 30 micro-arcseconds relative positional accuracy between maser sources and background QSOs at each epoch. Before beginning this project, we determined trigonometric parallaxes to 11 star forming regions with accuracies of order 10 micro-arcseconds. We also measured absolute proper motions with accuracies of order 1 km/s. These results have been published in a series of papers in the Astrophyscial Journal in 2009. New results for more than 100 sources were published in 2013 and 2014. Θo = 240 ± 8 km/s. The ratio Θo/Ro can be determined to higher accuracy than either parameter individually, and we find it to be 30.57 ± 0.43 km/s/kpc, in good agreement with the angular rotation rate determined from the proper motion of Sgr A*. The data favor a rotation curve for the Galaxy that is nearly flat between Galactocentric radii of 5 and 16 kpc. Kinematic distances are generally too large, sometimes by factors greater than 2; they can be brought into better agreement with the trigonometric parallaxes by increasing Ro from the IAU recommended value of 25.9 km/s/kpc to a value near 30 km/s/kpc. Adopting a theoretically motivated prior that high-mass star forming regions are in nearly circular Galactic orbits, we estimate a global solar motion component in the direction of Galactic rotation, Vsun = 14.6 ± 5.0 km/s. While To and Vsun are significantly correlated, the sum of these parameters is well constrained, To + Vsun = 255.2 ± 5.1 km/s, as is the angular speed of the Sun in its orbit about the Galactic center, (To + Vsun)/Ro = 30.57 ± 0.43 km/s/kpc. 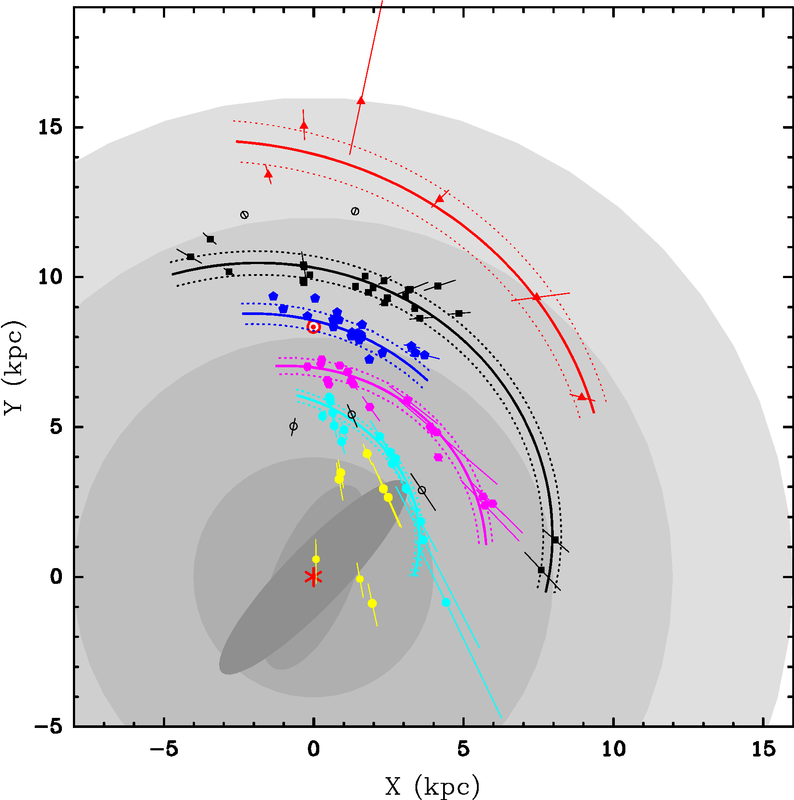 Finally, our estimates of Θo and Ro, when coupled with direct estimates of Ro, provide evidence that the rotation curve of the Milky Way is similar to that of the Andromeda galaxy, suggesting that the dark matter halos of these two dominant Local Group galaxy are comparably massive. Published in Reid et al. 2009 ApJ 700, 137 and Reid et al. 2014 ApJ 783, 130.